At over 18 Bcf/d, Pennsylvania now yields over 20% of all U.S. gas, only behind Texas' 22 Bcf/d. In the 10 years since a shale revolution took flight in its Marcellus play, Pennsylvania's gas output has exploded 32-fold. Over that time, Pennsylvania has been responsible for 6 Tcf of the entire nation's 11.6 Tcf of new gas supply. With so much gas being produced and transacted in the region, some have even suggested that Dominion South hub 40 miles northeast of Pittsburgh should become the new benchmark for U.S. gas prices, taking over for Henry Hub in Louisiana. For its own part, with massive low cost local supply, Pennsylvania has been turning more to natural gas to meet energy demand. Gas is now 35% of Pennsylvania's power generation, up from 23% in 2012. And why not? As demonstrated a few years ago, more gas has displaced coal and lowered Pennsylvania's power sector CO2 emissions by 30%. Over the past decade, gas has doubled its share of Pennsylvania's total power capacity. From 2016-2018, Pennsylvania saw some 16 new gas plants being built worth $15 billion. And as more coal and nuclear plants get pulled offline (e.g., infamous Three Mile Island will be retired this year), and intermittent renewables remain limited, even more gas will be required. To be sure, however, Pennsylvania has become a key battleground for those looking to subsidize uneconomical nuclear plants, something that could cost consumers hundreds of millions of dollars. The state is also looking to become a shale-based manufacturing hub for plastics, with an initial ethane cracker plant from Shell beginning operations next year 30 miles northwest of Pittsburgh. Those other states that are turning more and more to gas, yet do not produce much themselves, should take notice exporter Pennsylvania will need to keep more at home. "Pennsylvania's Natural Gas To The Rescue." These import dependent states should be doing more to produce what they can, namely gas-based New York since the state is blessed with its own Marcellus reserves, yet all the while even blocks pipelines carrying more Pennsylvanian gas into The Empire State. Moreover, Pennsylvania's Governor Tom Wolf's $4.5 billion proposal for a gas severance tax would not just be a problem for Pennsylvania but also for the other states that rely on its gas. Pennsylvania's legislature, however, has refused to approve the tax over the past few years because it could disrupt a booming shale gas industry. In other words, higher taxes and/or more regulations in gas giant Pennsylvania could have a negative ripple effect across the country (and really even the world as U.S. LNG exports ramp up). This could jeopardize the entire U.S. electric power system: already at a leading 45% of installed capacity, EIA projects that gas will add 18% more capacity across the nation in the coming decades than wind and solar combined. 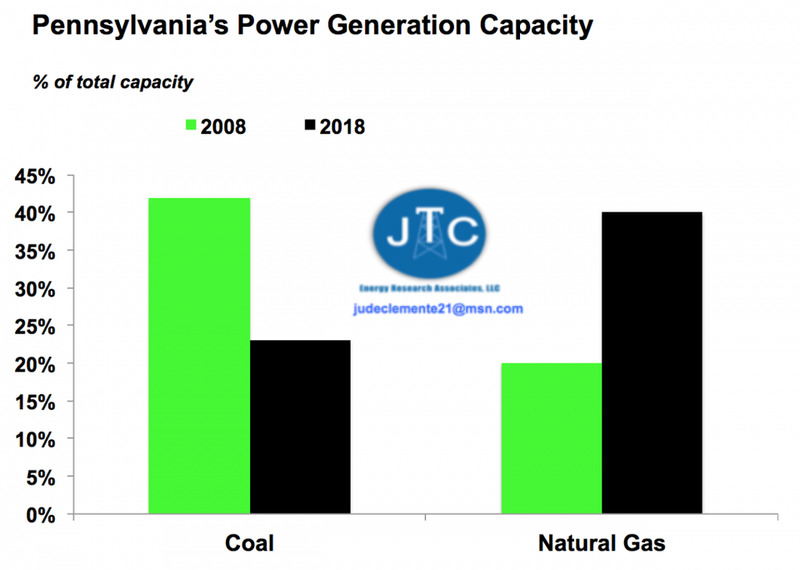 Natural gas has replaced coal in PA and is now the state's main source of power. Not just surging production, Pennsylvania also has rising demand. Pennsylvania's gas production increased nearly 15% in 2018, bolstered by the rush in summer and early-fall to fill new capacity on the Atlantic Sunrise pipeline system. Also helping, "Hedging Helps Ensure Surging Appalachia Natural Gas Production." Just five companies produce 65-70% of Pennsylvania’s natural gas. But, more capital discipline and less drilling from EQT, Cabot, and Range Resources this year could mean slower growth. The future remains very bright. Thanks to evolving technologies and practices, numerous Marcellus gas producers can breakeven when gas prices are just $2.15 per MMBtu or even below. The mighty Marcellus holds a staggering 125 Tcf of proven reserves, with the resource being many times higher. Even with booming production, Pennsylvania's role as a gas giant continues to be constrained by a lack of pipelines that ship gas out of the state. As predicted a few years ago, there is now some $30-35 billion in pipelines coming to Appalachia. This is why the region is at the heart of EIA's 1-2% projected annual increase for U.S. gas production for decades to come. These critical infrastructure projects, however, often face delays and enough skilled labor is a growing concern as Baby Boomers retire. New pipelines taking gas out of the state will help producers sell their gas to more distant, higher-priced markets. The Appalachia gas boom continues to transform the U.S. pipeline network, with flows becoming more east to west and east to south. Dominion South's discount to national prices in recent years will be a lowering differential as more pipelines come online and enhance gas-on-gas competition. Pennsylvania is now producing around 18-19 Bcf/d.